The use of reverb in modern production seems like something of a no-brainer, but making sure you’re using it correctly can be the difference between creating an expansive 3-D sounding mix and well, not a 3-D mix i.e flat, washed out or muddy. 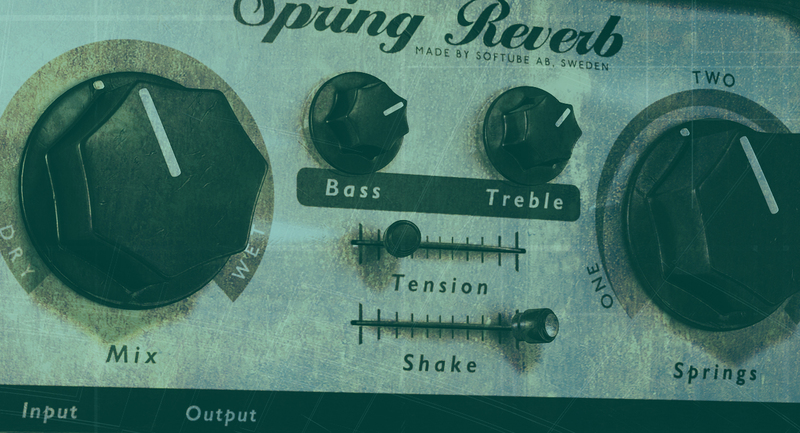 Second to this, both modern and vintage reverbs offer a variety of FX options enabling you to create a plethora of new virtual spaces and effects. In this post, we’ll look at the different types of reverb and how to use reverb effectively. Most DAW’s come equipped with a whole host reverb types. Plus, there are literally thousands of reverb plugins out there. You’ve no-doubt heard terms like plate, spring and hall before, but what exactly do these mean and what is the difference between them? Plate – A traditional classic that’s based on an old piece of sheet metal or ‘plate’. The signal is sent through the metal using a transducer and a set of dampeners control how much the sheet vibrates. Expect to hear minimal early reflections but lots of smooth clean reverb. Room – Based on the old concept of placing a microphone in a room and replaying the sound through a speaker, this reverb can provide a natural sense of space and realism. Imagine anything from tiled bathrooms to a dead-as-you like ‘drum room’. Hall – Expansive and super stereo, these predominantly replicate long reverb times with minimal to no early reflections. Great for adding a true sense of depth or drama to any sound. Spring – The dub classic! Does exactly what it says on the spring and sounds undoubtedly awesome. Works on a similar concept to the plate but in this case, a spring is excited and controlled by tension or length. This beauty guarantees noises a’ plenty. “Both modern and vintage reverbs offer a variety of FX options enabling you to create a plethora of new virtual spaces and effects”. So, what do the dials mean? This may seem obvious but understanding these basic features can make the world of difference. Size – This relates to the perceived size of the space that you’re placing objects within. It can be the difference between a stadium and a bathroom and is often measured in meters. Dampening – This relates to the surfaces within the space that you’ve chosen. High dampening would be the equivalent of covering the walls with acoustic treatment, no dampening could be perceived as tiles on the walls. Filters – An often over looked feature. These give you the ability to filter out frequencies that you don’t want within the reverb. Quite often these are available both ‘pre’ and ‘post’ reverb. Early reflections – These are the sounds that reflect off of the nearest walls inside our virtual space. Stereo image – How wide do you want the reverb? This ranges from full stereo width to super mono. Decay Time – This is the time taken for the reverb to die off or lose energy. Often measured in seconds and milliseconds. The beautiful thing about modern DAW’s is the ability to automate everything, with ease. We have the ability to automate so many items within our plugin of choice. My personal favourites are size, time and reflection. In this example, check out how Logic struggles to keep up with my automation changes thus providing some weird and wonderful effects for us to play with. In the last FX 101 we looked at creative ways of using delays to create dub inspired FX. 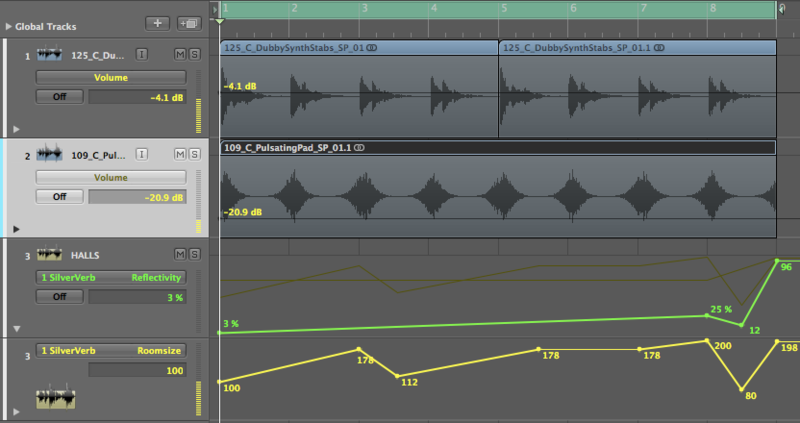 Carrying on with that idea, let’s explore the use of spring reverbs in a dub context using both hardware and software. Software – A few fine options spring to mind, the guitar pedal board from Waves offers a great recreation of a classic spring reverb. Placed on an aux send, this can add a special twang to your dub snares or a sense of vintage weirdness to guitar stabs and skanks. 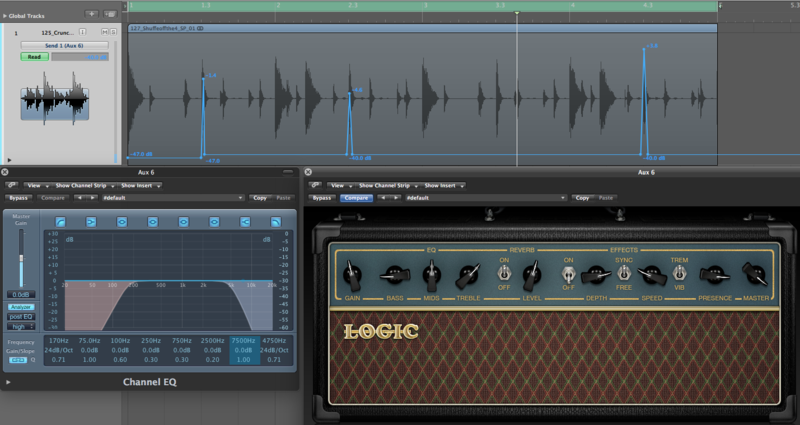 Many guitar amp plug-ins also offer the same option including Logic’s very own ‘Amp designer’. Hardware – Many classic guitars amps have been torn apart to reveal the spring that slept within them. A quick dig on the second-hand market should reveal some great results, especially as many of them are fitted with ¼” jack in and outs, so can be easily incorporated into your setup. As a little treat, you can also get some awesome sounds by hitting the spring with a knife or whatever else takes your fancy. Duubbbbbbb-twanngggggg! In the example below, I’ve taken a basic drum loop from our Dusty House Grooves collection and automated the send in Logic. This is going to a bus that houses the Logic Amp Designer. As you can see from the image below, I’ve also included an EQ to get rid of any frequencies I wasn’t fond of. So there you have it – the humble reverb examined and dismantled showing there’s a wealth of options available other than just the usual ‘make things sound far away’ trick! How do you use reverb in your tracks? Let us know in the comments below.